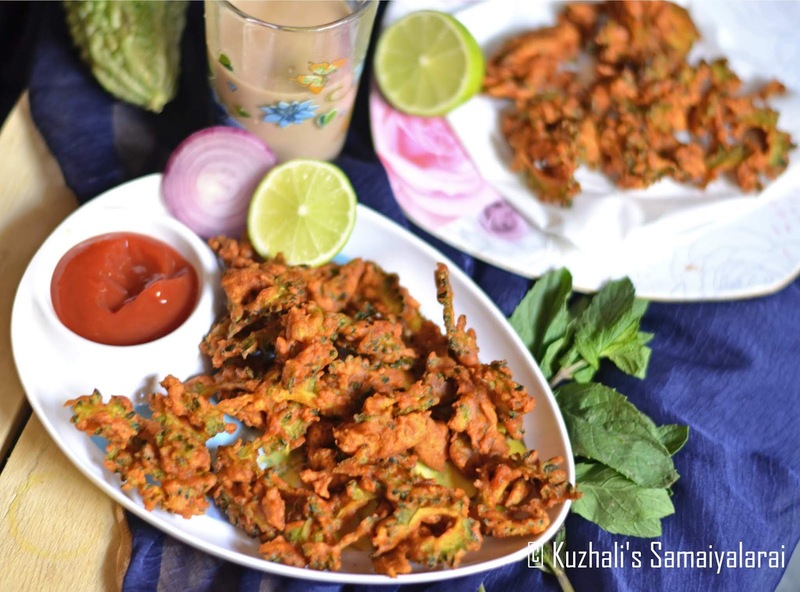 Bittergourd pakoda is a healthy at the same time awesome snack recipe to munch with evening tea. 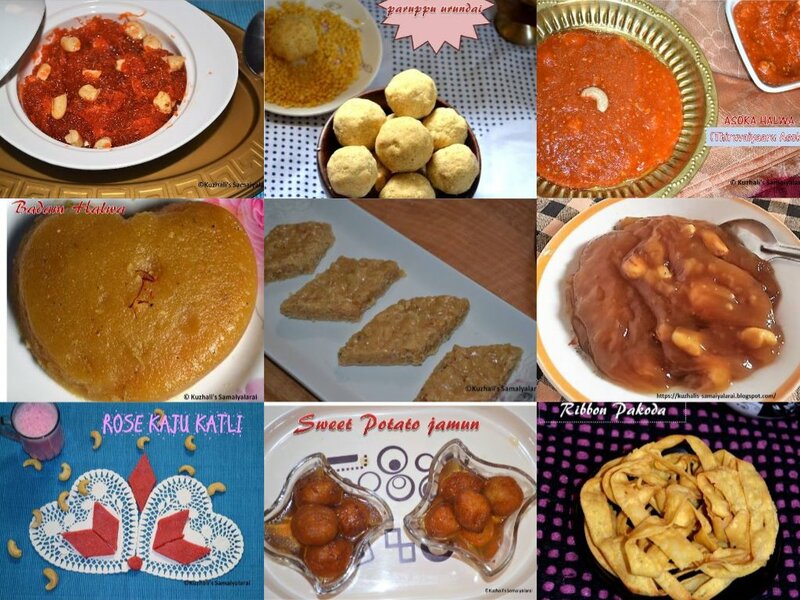 Generally most of us are little hesitate to use bittergourd because of its bitter taste. Me too was not an exception J. 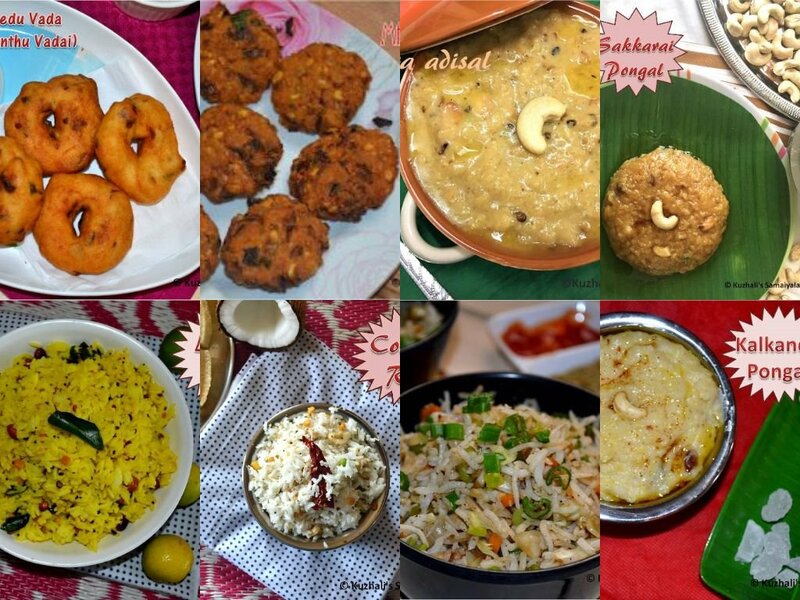 Yes., I was , coz, nowadays I become so much a big fan of this bittergourd, even my hubby too. The technique is in the preparation only. 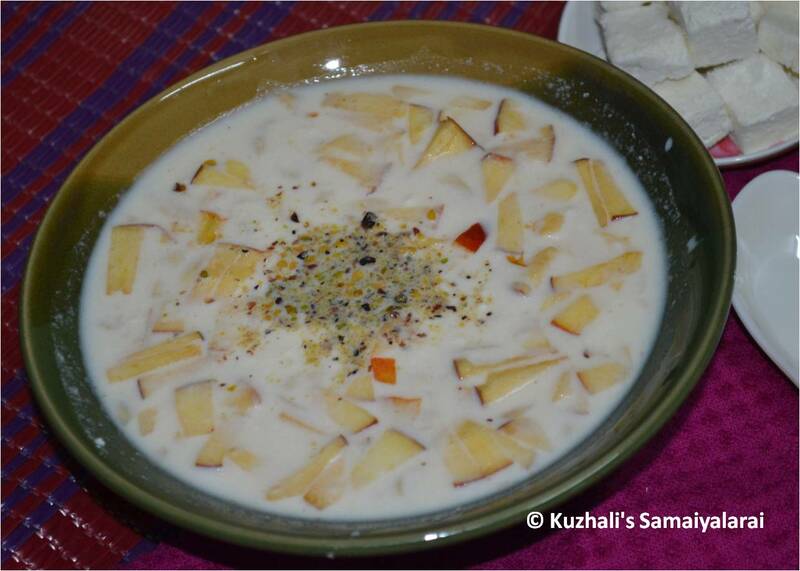 · Soaking the chopped /sliced bitter gourd in buttermilk with little salt for around 30 minutes. 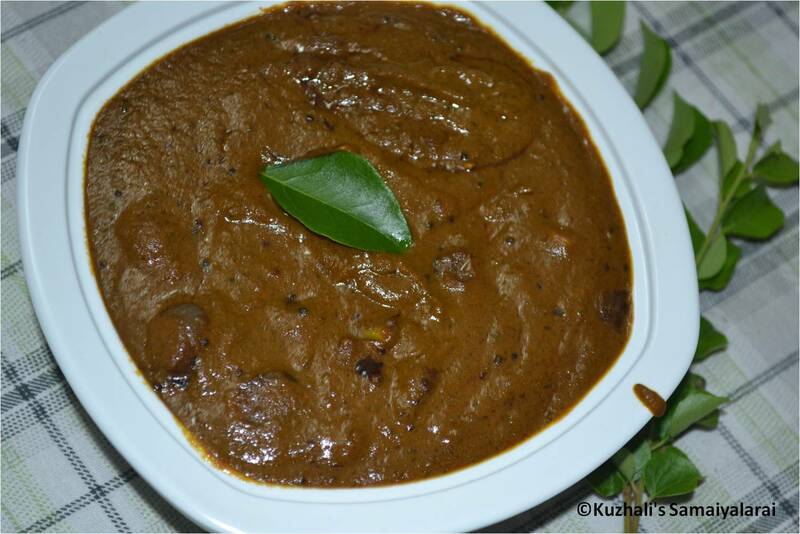 · Soaking the chopped/sliced bitter gourd in warm water or regular water with little salt and turmeric (optional) for around 15 to 30 minutes. I usually don’t prefer to boil this veggie and discarding the water, it may reduce the bitterness completely, but the nutritional benefits also will be lose. 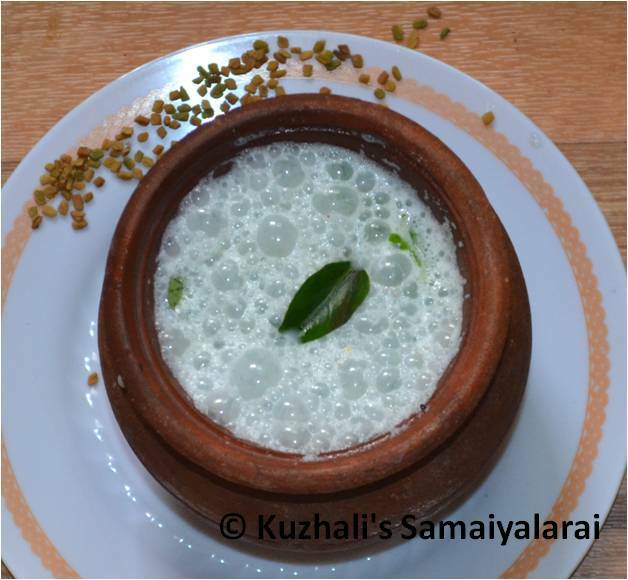 Generally to make puli kuzhambu/sambhar, I used to soak the chopped bittergourd in buttermilk with little salt. 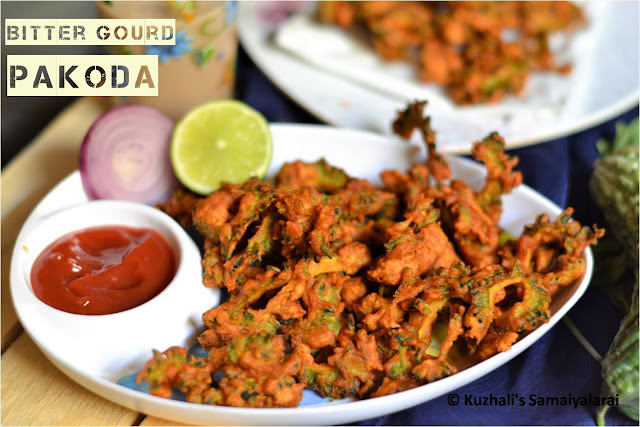 To make pakoda or fries, I soak the bittergourd in plain water along with salt and then will use. 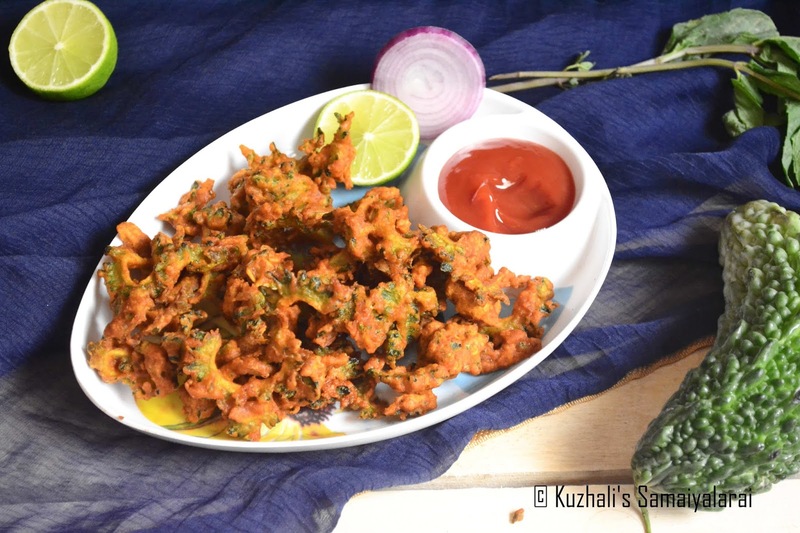 Here in this pakoda recipe soaked the sliced bittergourd and soaked in salted turmeric water to reduce the bitterness. 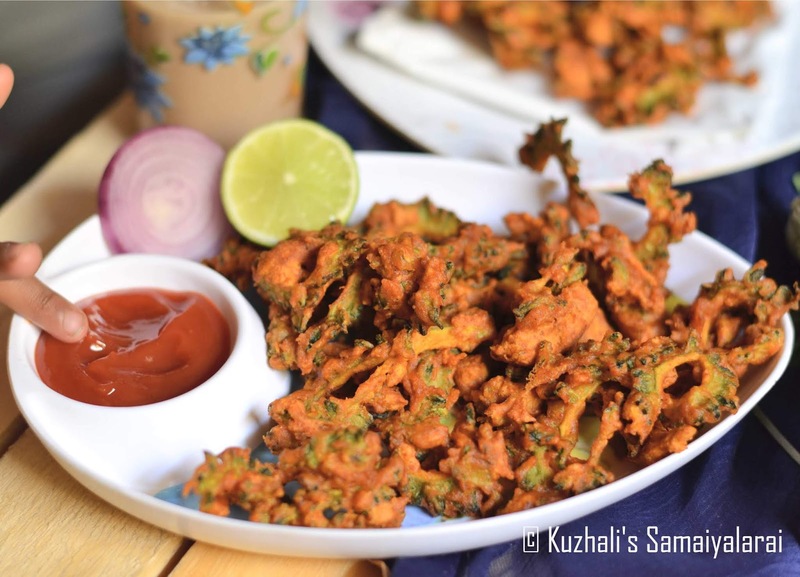 And one important thing to make crispy pakoda is slicing the bitter gourd. 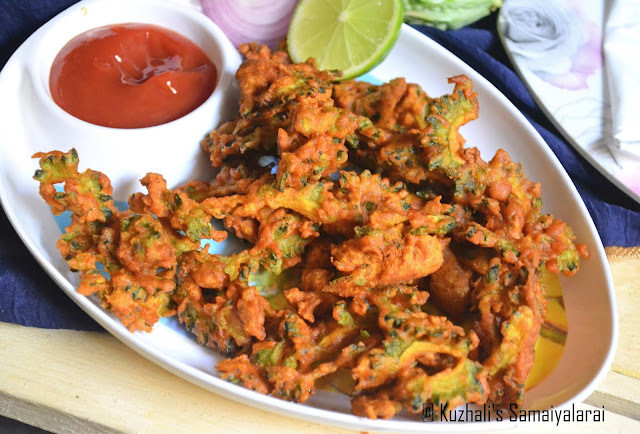 Yes., slice them very thin as much as possible, it will give you really yummy crispy pakoda. Wash the bitter gourd and slice them very thinly. Then soak them in water along with little salt and turmeric for around 15 minutes. Drain the water from the bitter gourd completely. 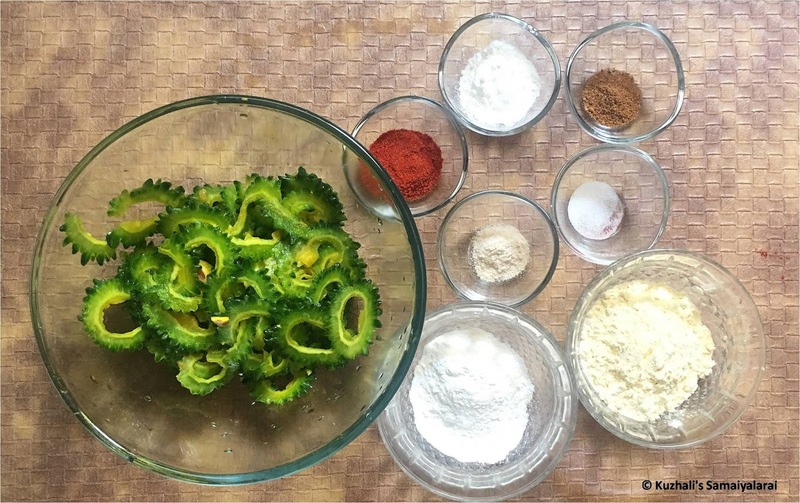 Then add the gram flour, rice flour, corn flour, red chilli powder, garam masala powder, and asafetida. Mix well. Add required salt. Adjust the salt as we have already added while soaking the bitter gourd. Mix everything well with hands, by squeezing the bitter gourd and mix. No need to add water. In a frying pan, take oil and let it heat. Once the oil becomes hot, drop the prepared spice mixed bitter gourd as pakodas. 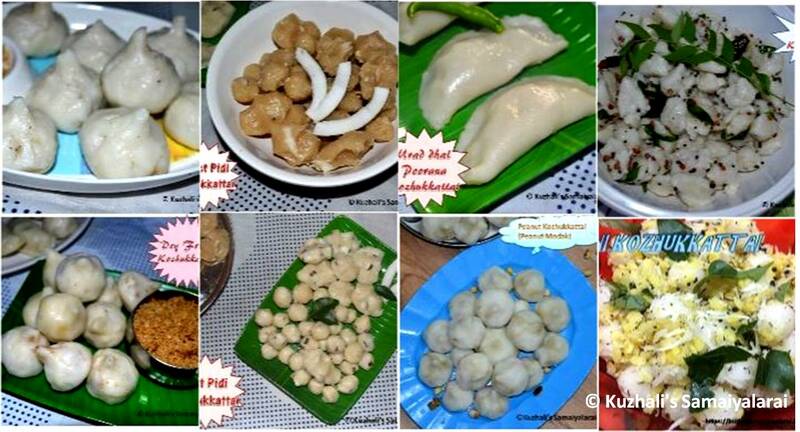 Let it cook in medium hot till it becomes crisp and golden brown. 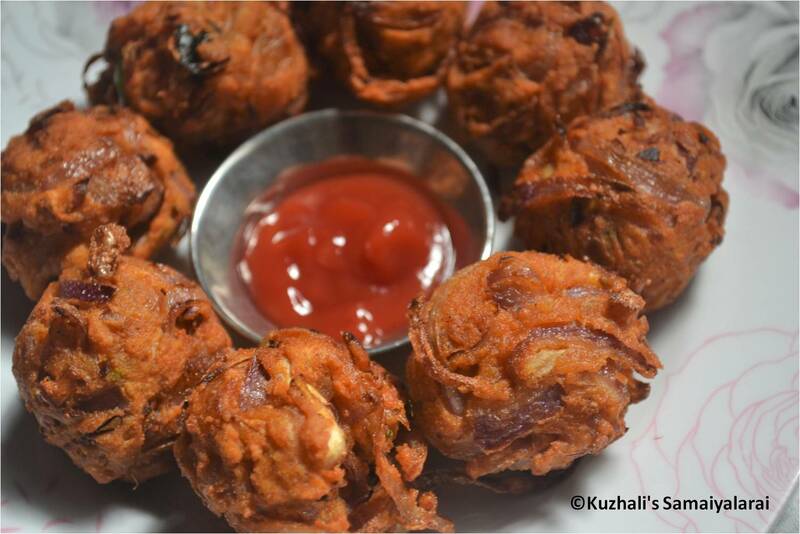 Remove from hot and drain the crispy pakodas in a paper towel. 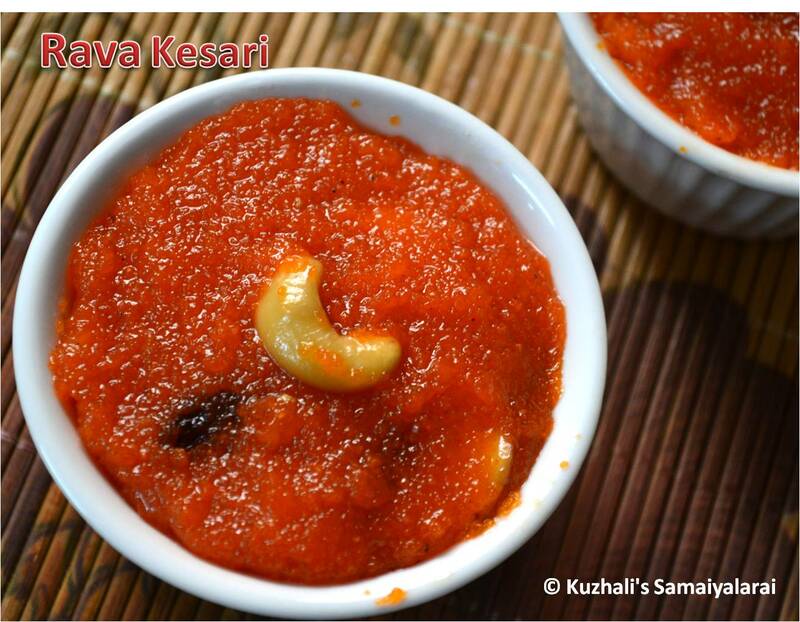 Serve hot with simple tomato ketchup or any chutney of your choice. Soaking the bitter gourd in water will reduce the bitterness. Be careful while adding the salt in the batter as we have added a little while soaking itself. 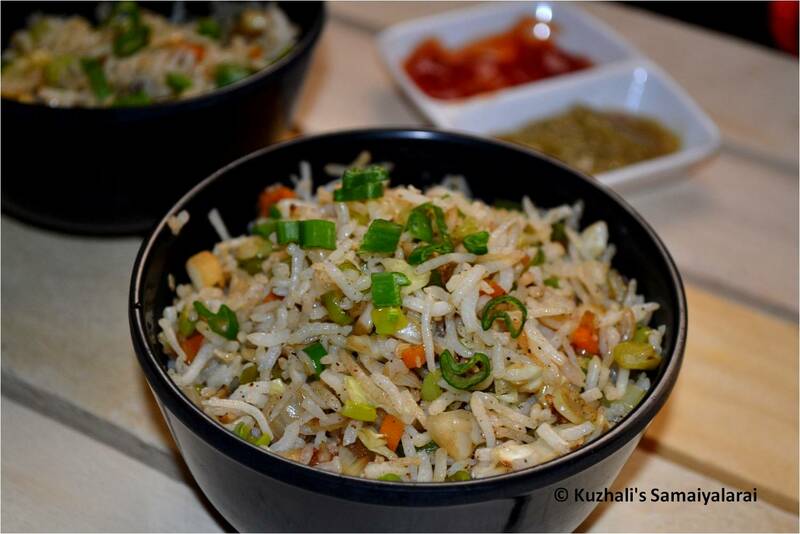 Adjust the spiciness by adding or reducing the amount of chilli powder as per the bitterness in the veggie. Adding corn flour will give you crispy pakkodas. Thin slicing the bitter gourd is important to get crispy pakodas. 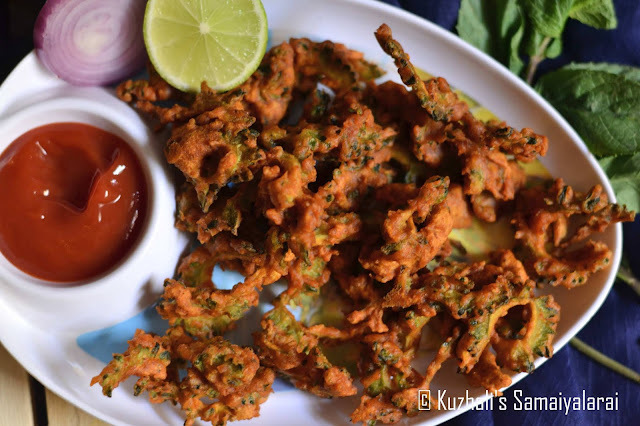 Adding garam masala gives nice flavor to the pakoda, if you don’t want, you can skip it . 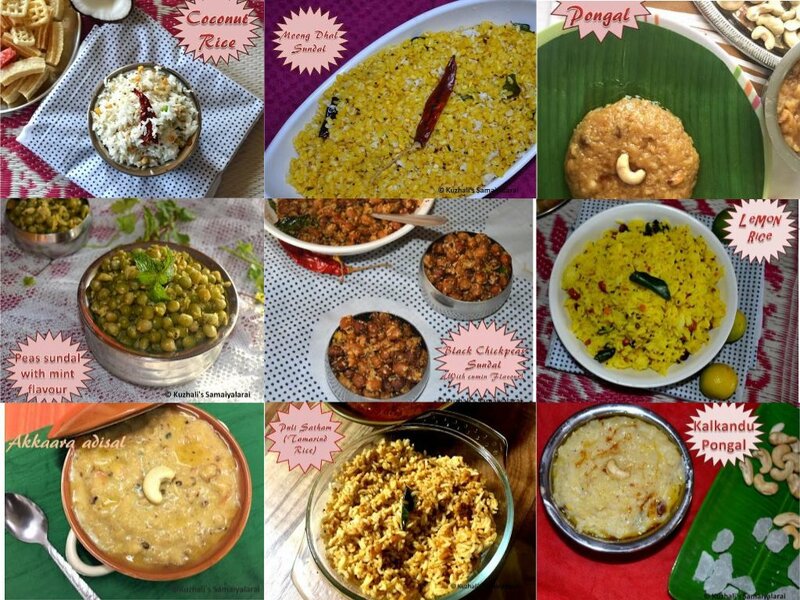 I would love to keep track of your posts, it is really a useful source of information, wish you success.